Apparently this last year has been one of warmest on record, December certainly has been very warm, one small hint of my beloved snow & I wasn’t even here to see it happen, oh the irony! It’s exceptionally windy & tipping down with rain as I write this, & warm, feels more like September than the end of the year… It’s not normal!!!! Anyways, I’m still hopeful for some snow, persitant stuff, at least a foot deep, I’m not interested in a paltry dusting you understand, it lacks effort in my opinion. You can’t knock the effort this wind & rain is making though can you , it’s definitely caught our attention. Anyways, enough of the weather, on to cake things & gingerbread, & baked treats that sazzle your senses & tickle those tastebuds & well, other things! 2015 has been extradinarily quiet for me to be honest, I have genuinely only made one batch of cupcakes in the whole year, can you believe it, I’ve been taking the imposed rest & recuperation quite seriously & I’m pleased to say, tentatively that things are looking up. I’m looking forward to 2016 with a degree of optimism, nothing is definite but I have everything crossed for a return to baking for you all at some point in 2016, now wouldn’t that be nice! Nothing is certain these days of course but a positive outlook is always good to have! 2016 holds so many things to look forward to, plenty of Treacle Markets, the great & wonderful Barnaby Festival of course, brilliant new independent shops opening, visits to the countryside, snow, sunshine, lazy hazy summer days, first blossom, cake, apples, rhubarb, strawberries, the buzzing of happy bees , profiteroles, gingerbread buttons – lots to look forward to – I can’t wait! I’ve come to realise over this last year though, that the love, understanding, patience, care, resilience & steadfastness, of those who I hold close in my life are the most cherished treasures a girl could ever wish for, well that & chocolate, & sparkly glass cake plates & gingerbread of course, it’s all about balance! So I wish you, on the cusp of the New Year – Health, Wealth & Happiness, may your deepest wishes come true, may your resolution be rewarded, may positivity fill your world, may your hard work ,determination & resilience reap what you sow & always, always love & be loved & eat cake!! Happy New Year Dearest All, see you next year! Anyone for a Wimbly Womble! I’ve completely lost track of the days as you do over the Christmas holidays, so it came as a bit of a surprise to find out it’s New Years Eve already & Wednesday. I have slept for most of the holidays if I’m honest, I was really quite exhausted by Christmas Eve & then came down with an epic cold as you do. So I’d love to say I’ve planned an epic night of partying, with heaps of friends, ridiculous drinking games, endless quaffing & general New Year bawdiness but alas not for me, those partying days of old, of dressing up in quirky, eye catching fancy dress which took days to plan, with no regard to the freezing temperatures are definitely over! I’m more likely to be snuggled up on the sofa with a hot chocolate & marshmallows, well it is New Year, in my onesie & elf slippers, wondering when it would be polite to go to bed – Oh how sensible & boring I’ve become! I fear (& hope) I’m not the only one, yes, please someone tell me this is their life too… please…? Or….. I could just throw caution to the wind, let loose the pink fizz & just get absolutely trollied & have done with it, I’m even sure I spotted a bottle of Baileys in the cupboard!!! I guess I’ll let you know tomorrow. Anyways, enough of the not even drunk ramblings, as is customary at this time of year, lets have a look back at the High Lights from the year that was! It’s mostly of cake can you believe it, & heaps of it too! Deepest Darkest Chocolate Valentines, not long to wait for these again! Macclesfield Physio Pilates celebrates 2 years in Business! It was all about the buttons in 2014! Lots & lots made! Lots of days spent here! New Kitchen Friends from Deja Vu! The Lesser Spotted Macclesfield Bat made it’s debut appearance! Tremendous Treasures from Deja Vu! Christmas Came to CocoaNokos & it was made of Gingerbread! And The Best till last, the Amazing Gingerbread House I made for Plums Kitchen! So many high lights, so much cake & gingerbread made & here’s hoping lots, lots more in 2015! 2014 has been a tough year for lots of reasons, but despite all the hurdles I feel I have achieved such a lot, but I really couldn’t have done without the love, kindness, patience, understanding & support from my most wonderful Family & Friends. I am one very lucky Little Baker! So to you all, I wish as 2014 comes to a close, that 2015 brings you Happiness & Health, that you love & are loved & All your Dreams come true! May 2015 be everything you wish for! So it’s the first Festive Treacle Market on Sunday, how wonderful!! That means 2 chances at getting your mittens on some rather wonderful festive fare, heaps of treasures, cart loads of beautiful pressies, there’ll be festive music, a carousel & oh so much more! But to keep your spirits up & your energy levels high you’ll some to keep you going, which brings me neatly to this months menu! So Fairy Cakes & morsels are priced at £1.50 each or the special Treacle Market Box Price of 4 for £5.00, gingerbread priced individually. Cosy Spicy Apple & Cinnamon – Moist & Spicy sponge with spicy warm buttercream with suitably Christmas shapes Cinnamon Biscuit! Orange, Chocolate & Cinnamon – The King of the Christmas Menu, Zesty, aromatic & utterly Wonderful! Mince Pie Cake – Warm & spicy Mulled spice & Mincemeat Christmasy Sponge – Christmas Perfection! Vanilla & Nutmeg – subtly Spiced & slightly exotic – delicately flavoured buttercream – topped with perfect Vanilla biscuit! Christmas Trees – Decadent Chocolate Sponge with perfectly poised Christmas Tree Buttercream & Sparkly Sprinkles! Gluten Free Simples – Wonderfully Moist Chocolate Sponge with voluptuous Vanilla Buttercream – Gluten Free Perfection! Double Trouble – Divinely moist Chocolate Sponge with rich chocolate buttercream with a top of sprinkles & chocolate stuff! Doodle Lou’s Victorious Sponge – layers of gorgeously light Victoria sponge & raspberry jam, Vanilla buttercream & dusted with golden caster sugar! NEW!!! Luscious Lemon – Lovely Luscious Lemon Sponge with zesty lemon buttercream – Lemon Lovers Heaven! Deepest Darkest Chocolate – Divinely moist chocolate sponge with seriously dark chocolate ganache! Only seriously chocoholics need apply! Simon’s Coffee Cake – Rich Coffee layer cake, with a tiny hint of Vanilla topped with wonderful Coffee Buttercream & chocolate coated coffee beans! ChoccyCaramel Cake – Moist chocolate sponge, a centre of creamy caramel, topped with Vanilla Buttercream & oodles of chocolate & caramel drizzle! Lemon Drizzle – The Infamous & Legendary Luscious Lemon Drizzle, one slice is never enough! Vicki Victorious Sponge – layers of gorgeously light Victoria sponge & raspberry jam, dusted with golden caster sugar! Sticky MaccTreacle Cake – Deeply dark treacly, orange & ginger cake, utterly gorgeous! Chocolate Chip Cookies – Best recipe ever!! 50p each! Gingerbread – Secret Recipe Gingerbread, extensively taste tested as only the best will do! Please feel free to sample the specially created Treacle Market Gingerbread Festive Mittens that will only be available while stocks last!! Looking forward to seeing you all on Sunday, bright & early!!! It’s exactly one month to Christmas Day. Now I’m not saying I’m panicking exactly, well not outwardly, well not yet anyway, but…. There’s definitely visions of sugared plums dancing in my head, whether I’m awake or not, I’m consumed by gingerbread, which to be fair isn’t as much of problem as you’d think. I’ve accidentally merged the Christmas play list with the everyday one on my iPod, (yes, you assume right, I file Christmas music, I’m ok with it & so should you… OK???). So essentially, the path well trodden & seldom totally prepared for is before me. Christmas, whether you like it or loath it is coming… So pass round the tin of Quality Street, crack open the sherry, it’s time to plan ahead. My intention is to keep this particular blog piece short & sweet, a bit like my good self, & to share with you where & when you can get your woolly mittens on some fine CocoaNokos fodder, because as we all know, it’s good to share. Sunday 30th November will find us at the region’s FAVOURITE Artisan Market – Treacle Market!! This month is the first Christmas Treacle Market & will be chockablock, rammed to the rafters, filled to the brim with amazing produce, stunning art, wonderful crafts, fabulous entertainment & oh so much more! Free parking all day too! Definitely bring bags a plenty, you WILL need them, for a truly amazing market! And we’ll be on Castle Street, with cakes aplenty & more gingerbread than you can shake a stick! And then as if that wasn’t enough, there’s another Treacle Market on Sunday 21st December, joyous times!! And inbetwix that, there’ll be treats a plenty at Macclesfield Train Station, as they will be holding several pop-up events, this Friday, Saturday & Sunday, & then every Saturday leading up to Christmas! We’ll be attending on Saturday 6th with gingerbread galore!!! Secondly & equally exciting, you can visit the rather awesome Plums Kitchen, on the Market Place, for some rather top nosh. You can get you’re CocoaNoko’s FairyCake fix there too! Serendipity not only have rather scrummy gingerbread cows & ChocChipCookies, along with a stunning array of unusual gifts! And then we have Food4Macc Direct, where you can order an abundance of local produce, including a veritable array of CocoaNoko’s produce! Shorter & sweeter than my usual, marginally! Back to baking gingerbread for me, so excited, Christmas is Coming to Macclesfield & it’s gingerbread shaped!!! It was about this time last year when I had a moment of literal fluidity, spouting all things New Year-ish, declaring how exciting the prospect of the forthcoming rollercoaster of a year that I envisioned landing on my doormat would be. Turns out it was exactly that, and more bumpy than I could ever have imagined & I am most definitely glad 2013 has almost waxed & waned its last. But before 2013 finally chimes out to make way for 2014, I’d just like to have a nosy as some of the highlights! Very proud to have been a small part in some spectacular events this year, very special birthdays, a wedding or two, plenty of Treacle Markets, lots & lots of Crazy Caramel Fairy cakes headed out for breakfast, dinner & tea, indeed lots & lots of cake! Quite a few little gift boxes headed over to Blue Buttons too. And then there was Barnaby 2013 of course, who could forget our magnificent Parade! So despite the moments of unimaginable sadness, unexpected illness & other such bumps, there have been some gems… And every cloud has a silver lining, including 2013. Bespoke Birthday Coffee and Walnut Layer Cake! Giant Fairy Cake, for the perfect Wedding! A Tiered Battenburg Wedding Cake completely battenburged in every way! Silly Moo Cows at Serendipty! The most beautiful Silk Butterfly that ever was! Barnaby Festival! There is another silver lining to 2013, somewhat invisible but there all the same & that’s the wonderful collection of people who have been a part of my rollercoaster year. New folks, old folks, lost & found folks, family folks & friend folks, wouldn’t/couldn’t do without folks, all cherished… To you all I wish for a prosperous, inventive, aspiring, rewarding, positive & productive 2014, may you find happiness in the weirdest of places, & as always love & be loved. Happy, Happy New 2014 to all! Christmas – has it arrived too early this year? Christmas – has it arrived too early this year?. After having a quick scout across the Internet & such like, there appears to be a definite divide as how peeps are tackling the New Year. Retrospective ponderings of the year that was or resolutioning the way into the forthcoming chunk of time. I can’t decide where I am in the greater scheme of things, but I know for certain yesterday was Sunday, it’s now most definitely Monday and tomorrow is predictably Tuesday. If I were to think retrospectively I would say I’ve experienced what I can only describe as a bumpy 2012. More like an out of control rollercoaster – immense dips and truly memorable highs, but also with Carousel like tendencies which has left me screaming at times to want to get off. I feel mostly shaken but very much stirred by it all. The positive spin is that the learning curve from all of this, as you can imagine, has been immense!! Christmas has given me the luxury of breathing space. I’ve been magically given the gift of time, to ponder the Rollercoaster that was, and to prepare for the one that will be. The difference this coming year will be how I approach it. And here’s the question – Resolution or Prediction? Resolutions aren’t really my thing if I’m honest. The process in itself appears to me self-defeating to start with and flawed. It only seems to benefit those who are there when a resolution is announced and there when you fail for the simple purpose of them pointing out your defeat! An obvious resolution there would be have a culling of ‘so called’ friends, if not in person then definitely from a virtual stand point! So resolutions aren’t the way forward for me so lets look at predictions! Would it be great fun to be able to predict the future do you think? Actually when I think about it, I’m not so sure. Some things are reasonably predictable aren’t they like the fact it’s more or less likely I’ll be a year older over the next year, I won’t be any taller than I am right now, I’ll be a different weight by the end of the year to right now (hopefully lighter!!) and at some point in the next year there will be sunshine… Ok that’s too much to ask – there WILL be rain!! But that’s all boring predictions, and well a little too predictable. I could predict I’ll be a millionaire over the next year but how probably is that?Not bloomin likely! So that leads us neatly and whimsically to hopes, dreams & wishes! Either way, to you all out there who read my wistful ramblings, my hopes for you all are this, may your resolution be silent but fulfilled, your predictions be positive, may you be the best person you can be, that you are kind and considerate to everyone and everything and kindest offered in return, that you love and are loved and may you have a glorious sunny summer, in which case, I dream you live near me! Happy, Happy 2013 to all! This is the intended menu for the very last Treacle Market of 2012! Boxes of 4 (£5.00) & 12 (£15.00) will be available & can be ordered ready for collection & payment on Sunday! Gluten Free – Wonderfully Moist Chocolate Sponge with voluptuous Vanilla Buttercream – Gluten Free Perfection! Double Chocolate – Divinely moist Chocolate Sponge with rich chocolate buttercream with a top of sprinkles & chocolate stuff! Crazy Caramel – Delicious rich Caramel Sponge with home made caramel buttercream, with drizzles of yumminess! Simon’s Coffee – Rich Coffee with a tiny hint of Vanilla with wonderful Coffee Buttercream! Silly Vanilly – Simply the simplest flavour there is but of so yummy, Vanilla Sponge topped with the whippiest lightest Vanilla Buttercream ever! I Should Coconut – Unbelievably moist Coconut Cake with lashings of Coconut Buttercream with Christmassy white Sprinkles! Fluttery Butterfly – Lovely Vanilla Sponge, with yummy Organic Raspberry Jam, a little swirl of Buttercream, sprinkled with snowy icing sugar! Lemony Ginger – Zesty, spicy Lemony Ginger sponge with equally yummy buttercream, topped with a cute a button Gingerbread Mitten! Apple & Cinnamon – Moist & Spicy sponge with spicy warm buttercream with suitably Christmas shapes Gingerbread Biscuit! Minty Chocolate – Minty Chocolatey sponge with seriously lush buttercream adorned with chocolatey mint stuff! Triple Chocolate – Bursting with decadent Belgian Chocolate – perfect partner to a steaming mug of Hot Chocolate! Coconut Macaroons – Utterly Moist & seriously flavourful Macaroons, liberally draped in Dark Belgian Chocolate! Please feel free to sample the specially created Treacle Market Gingerbread Mittens that will be available while stocks last!! LOOKING FORWARD TO SEEING YOU ALL ON SUNDAY!!! And don’t forget First Up gets the cake – only crumbs if you’re late!! 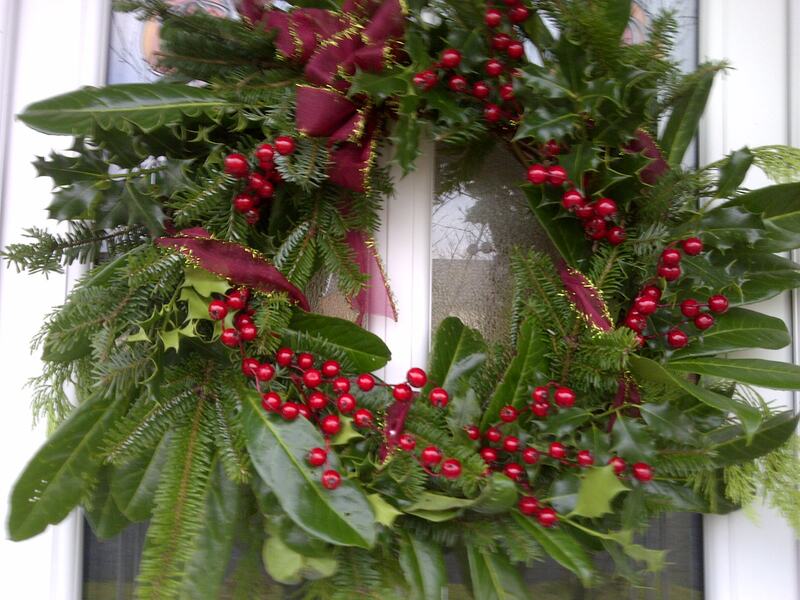 The Wreath is Up – not many sleeps to Christmas now! The Christmas Wreath has been made, it has been glamorously attached to the front door with the aid of Gaffer Tape and BluTak! It looks lovely, a biased opinion I can assure you, but it does look nice! It’s a little on the large size and you may have to squeeze carefully past it to enter the house and so not to be impaled yourself on the holly but I loves it! Lovingly made from the greenery and foliage that is in abundance in my garden, from the of-cuts from this years Christmas Tree generously donated or else it wouldn’t fit in it’s pot! Some not so natural but other wise gorgeous and richly coloured berries carefully placed and a quick raid of the carefully collected, stored and possibly quite vintage ribbon drawer and there you have it. This years Christmas Wreath, carefully, lovingly constructed without a wire or glue gun in sight. One is a happy, satisfied and contented CocoaNoko… For that precise moment anyway, I now need to clear up the mess…!